The market for telecom test and measurement (T&M) equipment has grown over time, in tandem with the growth in the telecom sector. The demand for communication test and measurement solutions is on a rise on account of growing bandwidth demand and introduction of next generation cellular and wireless technologies. In addition, increased R&D spending in telecommunication sector coupled with growth in mobile phone market have fueled market momentum. Vendors in the market are facing challenges in upgrading their integrated equipments to comply with the industry standards. T&M requirements have changed over time with the evolving standards in the telecom industry and are always driven by two considerations – performance and conformance of the equipment and systems to industry standards. Performance specifications are tested as per the manufacturer’s references and conformance parameters by the concerned standards. The industry has witnessed unprecedented growth in the past two decades and with an increasing subscriber base, the deployment of next-generation technologies and unprecedented data traffic, network complexity has also increased. The key growth drivers of the T&M industry are the introduction of new telecom technologies, explosion of data/video services, roll-out of 4G services, new quality of service (QoS) demands resulting from the increase in call drops, conformity to radiation specifications, spectrum management, etc. As the Indian telecom T&M industry is largely global in nature and local manufacturing of both terminal and network equipment is undertaken based on acquired technology, reference selling with big telecom manufacturers determines the local revenues. The market is increasingly adopting a software-defined approach towards instrumentation, which allows expeditious upgradation of solutions as per changing network and technology requirements. Wireless equipment and network testing continue to dominate the space with long term evolution (LTE), voice-over-LTE (VoLTE), QoS, scalability and smart devices being the key growth drivers. On the other hand, the growth in the optic fibre cable (OFC) testing instruments market has largely been driven by the increasing demand for splicing machines. 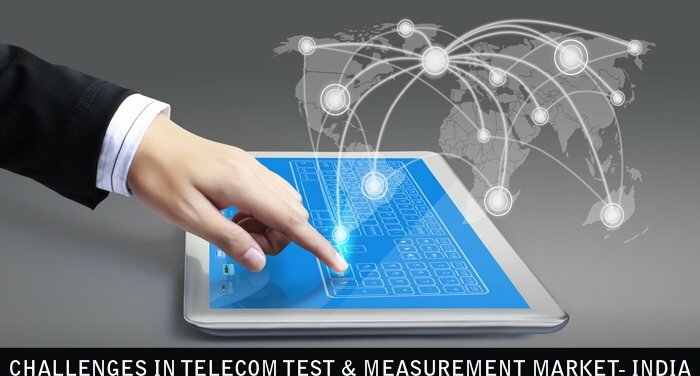 The latest trends witnessed in the telecom T&M segment are high bandwidth measurements, multiple-input, multiple-output testing and special tests on LTE-advanced technology.In addition, quality tests that are required by the operator before accepting systems supplied by the manufacturer are being developed. The inherent characteristic of the T&M market is such that the evolving telecom standards render T&M equipment obsolete quickly. Hence, the rental market has gained traction as it allows the customer flexibility to switch to the latest equipment without incuring significant investment. Globally, telecom service providers are focusing on mobile traffic Wi-Fi offload strategies. It is important to ensure that the quality of Wi-Fi networks becomes carrier-grade as a lot of mobile data is expected to be offloaded on to Wi-Fi networks. The large-scale roll-out of LTE technology has renewed interest in the T&M space with operators increasingly looking to deploy advanced solutions for assessing and addressing the complexities associated with the network. The demand for LTE and VoLTE testing equipment is set to grow. This has created multiple opportunities for small T&M vendors and has helped generate rural employment. The T&M market is extremely price sensitive. Test equipment companies have faced challenges in attempting to improve test capabilities and reducing testing time because of the excessive pricing pressure exerted by operators. Telecom T&M players in India are mainly local subsidiaries of top MNCs. While we have very qualified techno-managers and industry professionals, managing a specialised skill-based workforce is challenging in India. Further, growth in telecom following the surge in mobile subscriptions will be dependent on innovations and disruptions. Another challenge that test equipment vendors usually face is the successful provision of a testing solution that is suited to the skills and capabilities of end-users. Most companies lack the specialised labour needed to achieve this objective. The growing demand for bandwidth, multiple devices and increasingly complex network architecture will continue fuelling growth in the T&M market. The key driving factors would be the explosion in telecom and data services in the aerospace/defence sector. The sector may witness the emergence of specialised companies and also consolidation. This will segregate pure-play hardware and T&M system companies. It is necessary to have efficient T&M systems capable of integrating data with different formats because without them, testing costs will remain almost as high as equipment manufacturing costs. With the introduction of next-generation technologies and the need for service providers to ensure superior QoS, the segment will increasingly gain significance. Also there are tremendous opportunities for test equipment vendors as we are now shifting to IP/Ethernet technologies. With the introduction of next-generation technologies and the need for service providers to ensure superior QoS, the segment will increasingly gain significance. Government has planning to set up labs and testing centres which will go a long way in addressing the problems faced by operators while simultaneously opening up new opportunities for T&M players in the country. In recent months, the government has adopted a strict stance on the testing and certification of telecom equipment. It is planning to set up labs and testing centres which will go a long way in addressing the problems faced by operators while simultaneously opening up new opportunities for T&M players in the country.